Tiara Nostrand’s New Book “The Little Book of Everything” Is a Lovable Collection of Children’s Poems and Prose. Recent release “The Little Book of Everything” from Page Publishing author Tiara Nostrand is a charming book for children, complete with vibrant illustrations. Tiara Nostrand, a licensed cosmetologist, has completed her new book “The Little Book of Everything”: a fun and colorful collection of stories and poetry that are sure to entertain young readers. Published by New York City-based Page Publishing, Tiara Nostrand’s cheerful tales are a spirited and fun read for children. Nostrand’s works are accompanied by delightful illustrations, also done by the author. “The Little Book of Everything” has four short stories and four children poems with large detailed illustration to go with each story full of adventure, friendship, imagination, and lessons. From a curious Little Robbin anxious to fly, a clumsy puppy who makes a friend, a creative child taking the impossible and making it possible, learning to share will help make a friend right down to just being yourself. 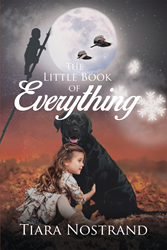 Readers who wish to experience this charming work can purchase “The Little Book of Everything” at bookstores everywhere, or online at the Apple iTunes store, Amazon, Google Play or Barnes and Noble.